Almost impossible for pets to pull off. This is an easy wash and wear product. 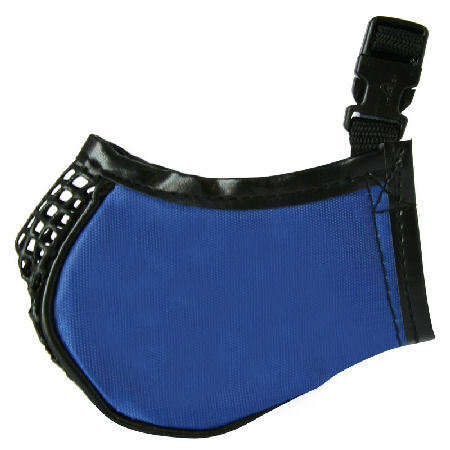 This is a soft dog muzzle that is intended for mild restraint in small to giant dogs. The muzzle is designed to be slipped on and secured quickly around the dog's muzzle and to provide increased comfort for the dog. Small = Blue - Miniature poodle, Sheltie, Bichon Frise, Miniature Schnauzer, etc. Medium = Orange - Fox Terrier, Beagle, Lhasa Apso, Keeshond, etc. Large = Green - Cocker Spaniel, Boston Terrier, Bull Terrier, Border Collie, etc. X-Large = Yellow - Husky, Labrador Retriever, Golden Retriever, Setters, etc. Giant = Red - Great Dane, Newfoundland, Great Pyreness, St. Bernard, etc.